I am again drawn to water. And, the sound, oh the soothing sound that it sings to us, drawing us close so that we may stand and stare. Does it ever stand still? Do we ever stand still? Can it enlighten us? What can it teach us? Simplicity. Be in the moment. Do not think of the future, do not think of the past. Live today. When we realise this then we are close to enlightenment. This is something that I must learn to do. I am always thinking ahead, thinking of next week. When I am in the garden, or out in nature, I often think of the tomorrow when everything goes back to sleep. I must try and think of the moment. Live the moment. Enjoy what is in front of me, around me, free my mind of the tomorrows. Be alive. This entry was posted in Road to Enlightenment and tagged black and white, black and white photography, castle eden dene, enlightenment, flowers, japan, japanese, mysterious, nature, pagan, path, photographs, photography, river, road, shinto, trees, water, wood, woods on August 28, 2016 by Catherine Ruocco. I feel at peace when I am close to water. I love to hear its soothing sound. It is our life source, the blood that runs through this land that we stand upon. Without it we cannot survive. Sometimes I feel I should follow it, see where it leads, see what I find at its end. But it never ends, it is continuous, it is infinite. There is no beginning, there is no end. Maybe that is life, no beginning, no end. Maybe life is infinite. Maybe we continue on in a different universe, a different life, on and on we go, seeking enlightenment at every turn. This entry was posted in Road to Enlightenment and tagged black and white photography, enlightenment, infinite, japan, japanese, mysterious, nature, pagan, path, road, shinto, trees, water, wood on August 25, 2016 by Catherine Ruocco. 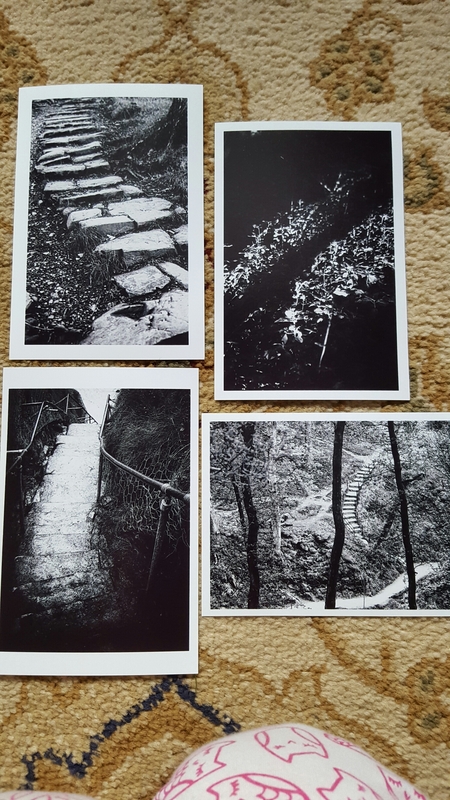 Little 6 x 4 prints just to see what my Road to Enlightenment series looks like printed off. Cheap little prints from asda but it’s always good to see what photos look like when they’re printed. Think they will look good on fine art paper mounted and framed too. The series is coming along nicely, getting a real feel for it. Especially as I am exploring the realms of Enlightenment and spiritual awareness. Trying to make sense of life and follow a path to maybe some kind of Enlightenment awakens the senses. Whether I will get there is another matter. Sometimes it feels like one step forward two steps back. We tend to pick up a lot of baggage over the years which is hard to give up and its quite easy to fall into the old ways. This entry was posted in Blackhall and tagged awakening, black and white photography, buddhism, enlightenment, japan, japanese, nature, path, road, shinto, spiritual on August 4, 2016 by Catherine Ruocco.